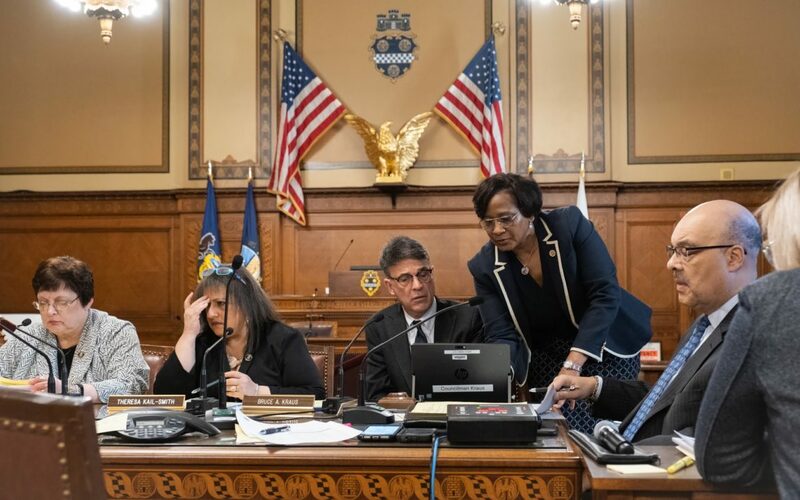 Pittsburgh City Council is one step closer to passing a trio of gun laws, which members have substantially revised in recent weeks to reduce the threat of legal challenges. Following the Oct. 27 Tree of Life synagogue attack, Pittsburgh officials cast the city as a national leader on gun control by introducing legislation they expected to draw lawsuits from pro-gun groups and by lobbying other cities to do the same. Council voted 6-3 Wednesday to move the measures to a final vote next Tuesday. If passed into law, council members expect swift challenges to the measures from gun advocates. “This is something the state should be voting on, not council,” said Councilwoman Darlene Harris, one of the three council members to vote no on Wednesday. Council members Theresa Kail-Smith and Anthony Coghill also voted against the legislation. “If we do a resolution and ask the state to do this, that's different but...we cannot vote on gun laws,” Harris continued. After gunman Robert Bowers killed 11 people at Tree of Life synagogue in an anti-Semitic assault, Pittsburgh City Council members Corey O’Connor and Erika Strassburger, as well as others, vowed legislative action. Strassburger’s district includes the Tree of Life synagogue in Squirrel Hill and O’Connor represents a nearby part of the neighborhood. The first of the three bills would place restrictions on the use of automatic and semi-automatic guns in the city. People could still buy and own those weapons in Pittsburgh, but the bill would prohibit them from firing them unless they’re at a target range. The second bill would place restrictions on the use of many firearms accessories, including metal penetrating bullets and large capacity magazines. The third bill would allow the city to remove guns from a person’s possession if an extreme risk protection order is filed against them. Since the bills were first introduced last year, city council amended all three significantly. Originally, the bills sought to ban the possession of automatic and semi-automatic guns and accessories. Now, the bills would ban the use of those weapons and accessories, not ownership. Under the measure, the AR-15 rifle Bowers used would be banned from use in the city. Weapons like grenades, flamethrowers, mines and bombs would be banned entirely. Knowing that the legislation would be challenged in court, council members said they made changes to make them easier to defend. 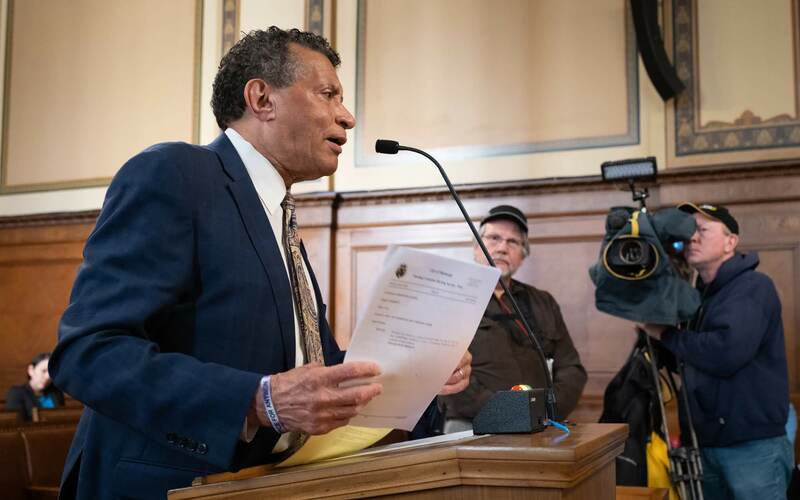 “In consulting with outside attorneys, they believe the word ‘use’ has actually never been challenged and that banning the use is actually legally defensible,” said Councilman R. Daniel Lavelle, who represents the Hill District. Initially, council members’ strategy was to persuade other municipalities around the state and country to to adopt similar legislation as a way of scattering opposition. 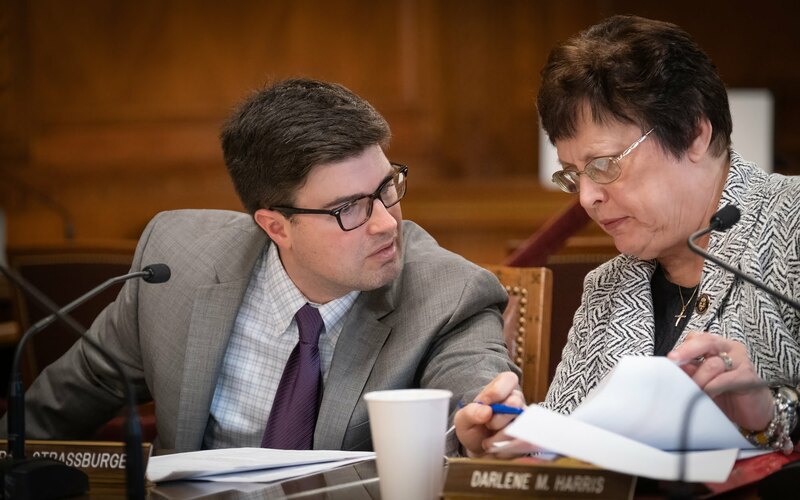 O’Connor said on Wednesday that some of the municipalities the city reached out to are waiting until Pittsburgh passes its bills before moving forward. Philadelphia passed a resolution earlier this month asking state lawmakers and the governor to allow Pittsburgh’s “common sense gun legislation” to stand. State law currently preempts local municipalities from passing laws that control the transfer, ownership, transportation or possession of firearms. Pittsburgh’s council members originally planned to pass the legislation around the anniversary of the mass shooting at Marjory Stoneman Douglas High School in Parkland, Fla. That anniversary passed Feb. 14. The National Rifle Association [NRA] announced its opposition to Pittsburgh’s proposed measures back in December. The NRA has previously sued Pittsburgh twice over a 2008 ordinance that requires gun owners to tell authorities when they realize their guns are lost or stolen. That law has never been enforced in the city. State lawmakers have also tried twice to make Pittsburgh and other cities easier to sue over local laws that infringe on gun access and ownership. Lawmakers in Harrisburg did, however, pass a law in the fall to force quicker surrender of firearms owned by convicted domestic abusers or subjects of protection-from-abuse orders. Because the three gun bills in Pittsburgh are at odds with the state law, three city council members said they couldn’t vote in favor of the bills. Councilwoman Darlene Harris, who represents the North Side, read the state’s preemption law aloud at Wednesday’s meeting. Harris said she could potentially face jail time per the state’s law if she voted for the bills. “I can tell you I don't like guns, I never did like guns, I have no guns in my home, I've seen what guns do with domestic violence,” Harris said. “But this is not ours” to vote on. Kail-Smith, who represents the West End, said she couldn’t vote for the bills because they would likely get the city sued and taxpayers would have to foot the bill. Coghill, who represents neighborhoods in the South Hills, initially co-sponsored the bills. Yet on Wednesday, he said he couldn’t vote for the legislation in part because of the cost. “A few years from now, if it cost the city, whether it be $200,000 or $2 million in lawsuits, I'm going to have a rough time going to my constituents,” he said. Since the bills were first introduced last year, Coghill’s position has changed. In October, he told PublicSource that he didn’t care if the gun bills got the city sued. “I've never really understood why anyone needs an assault weapon, unless they're on the field of war,” Stevens said. Council members on Wednesday also gave unanimous preliminary approval to a bill that would work to prevent police-related violence and other community violence. Called the Stop the Violence Initiative, the bill would coordinate the city’s activities and resources when it comes to preventing violence, provide dedicated funding to those efforts and establish strategies and community engagement related to preventing violence. Kail-Smith also said she worried the bills restricting firearms and accessories could lead to over-policing in the black community and that they address the type of gun violence that happens regularly in the city. In response to her concerns, Lavelle pointed to the Stop the Violence Initiative. Both Lavelle and Burgess said they believe that bill will begin to stem day-to-day gun violence the city.